David's Trail honors and remembers the contributions David Floyd made to his community. It will be a 50+ mile network of multiple-purpose trails located on 100% public lands surrounding Norfork Lake and designed to encourage an active lifestyle for all ages and abilities. David's Trail Endurance Run is providing a full-blown "experience" for our runners. Our host, Rocking Chair Resort, is our mecca for the weekend with Friday night's meet and greet, then a band, campfires, and food on Saturday. Stay on-site both nights and enjoy your suds and buds! Swag for David's Trail Endurance Run....all 50K, 25K, 11K, and 7K finishers receive finisher medals and some cool swag (maybe it's a shirt, maybe something else!). Cash purses for 1st overall male and female in 50K and 25K. We have plans to go bigger and badder! Trail expansion has added miles to the trail and course; in the not too far future we'd like to add a 50-Miler to the course offering! A ginormous Thank You to all those who participated, helped, donated and were a part of the very positive and successful inaugural David's Trail Endurance Run in 2016, as well as 2017 and 2018! Maybe we'll have a gorgeous day again for 2019 as we expand our participant pool! Rocking Chair Resort will again be the home base, and we welcome back the Mellow Mountain Band to entertain us! What were past races like? First of all, we've had awesome weather each year! Cool and sunny! Check out what ArkansasOutside.com had to say about DTER in this article. Watch the gun start video! Check out the photos as they're posted at ArkansasOutside Facebook page. Or go directly to the album for all the pictures. "​Thanks for a great event! That middle section was challenging but fun. Never run anywhere that had ropes to help climb out of the ravine. The course follows along the currently available portions of David's Trail. The entire 50K route spans from Robinson Point Park, through Panther Bay Park, across the Hwy 101 Bridge to, a left at Bidwell Park then north west on the trail past Take It Easy Resort for several miles. This follows all the points on ﻿this map﻿. 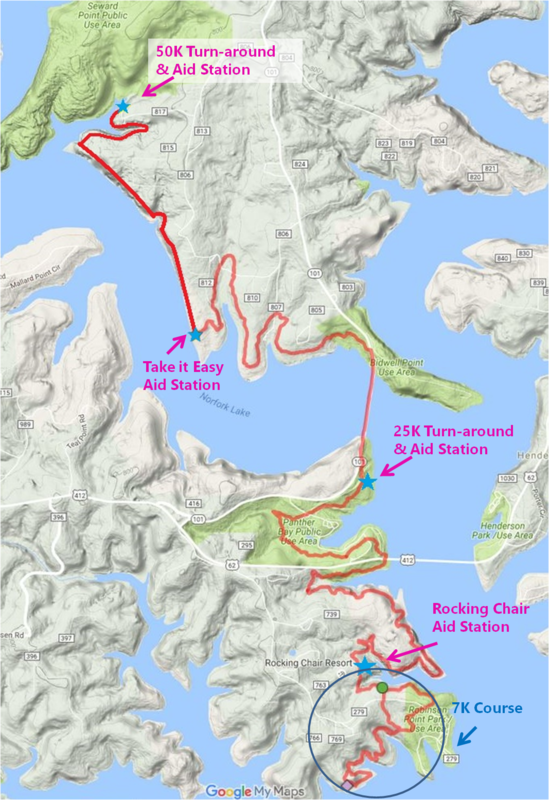 The 25K is the out-and-back to the Panther Bay aid station plus the 7K course . The 7K is contained within the blue circle and is tackled first for all races, then runners head to Panther Bay for the tail end of the 25K/50K. We like to think of the course in terms of phases. There is over 5,000 feet in elevation change along the 25K and 10,000 in change for the 50K while the 7K offers scenic and challenging terrain through the older portions of David's Trail. Like it or not, we all are potential role models. Spending time running or hiking the trails and enjoying nature is something we should all project outward, particularly to the youngsters. Proceeds from DTER will help fund K-12 activities on the trail. Follow the link to the trail expansion map. The portions in red are the current trail with the other colors representing the next three phases of trail building. Paul Gigliotti from Pirate Perry Events brings a wealth of organization and event management experience to David's Trail. He is an avid runner participating in all sorts of trail races. For the past few years, Paul has been a panelist speaker at the American Trail Running Association (ATRA) US Trail Running Conference. Jake Anderson is a seasoned and well decorated ultra runner competing in, and often winning, numerous races all through the U.S. from 10Ks in Eureka Springs, Arkansas to 100-Milers out West. ,Your Race Directors are veteran organizers and runners who jointly offer the right amount of diversity with the same objectives in mind. We've covered thousands of miles both on the road and trail, and we're excited to part of North Central Arkansas trail running community.